Imagine a heated porcelain tile floor on a cold winter morning. Imagine not waiting for hot water when you first step into your shower. Imagine the warmth of natural daylight from a skylight to brighten your day. These are the items found in only the most luxurious bathrooms, right? Wrong. They are just a few of the limitless number of conveniences that can be available in your own home! In the last decade, there have been countless new products available to transform your simple, everyday bathroom into a luxurious spa-like experience. Softer lighting, whisper-quiet ventilation systems, functional bath cabinetry, warmer windows and cleaner surfaces make for a beautiful place to spend a little time each day. 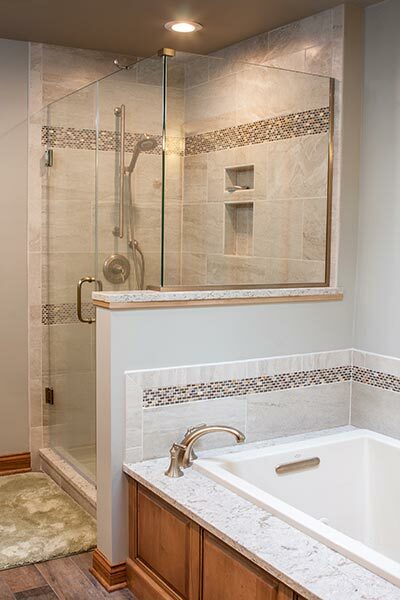 Designing and remodeling a great bathroom can be easy for you. We will meet with you in your home to offer ideas, suggestions or solutions to make your most personal space perfect! We are always current on all of the newest bathroom trends and can offer help in selecting all of the components you’ll want for the bath that fits your needs. We proudly recommend and specify fixture selections from Kohler and Grohe, cabinetry from Wood-Mode and Brookhaven, Panasonic Ventilation Systems, Warmly Yours radiant floor heating, and Cambria Quartz along with many other items that come together to help build the perfect bath. Whether your project is a simple powder room update, a main bathroom remodel, or an elaborate new master suite, we have the experience, product knowledge and craftsmen to make it a reality! Our clients have told us that we make the process both easy and enjoyable! Call us today for a friendly, no-pressure appointment!